The Fibre, Processing and Manufacturing (FP&M) SETA has previously been labelled as one of South Africa’s toughest training organisations to manage. An amalgamation of three SETA’s: CTFL SETA; FIETA; and MAPPP-SETA; the decision to join the respective entities back in 2011 left many stakeholders wondering if the newly formed body would survive. Taking on the enormous task of ensuring the smooth transition and integration to the new entity, CEO Felleng Yende had her work cut out for her. But four years down the line, the organisation is doing better than ever, and as she would tell you no uncertain terms, never say never. 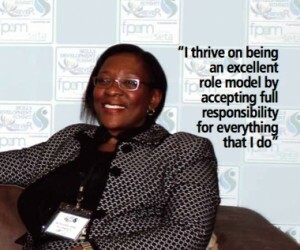 Having recently won two illustrious awards, her die-hard determination has earned her the titles of Africa’s Most Influential Women in Business and Public Sector Visionary in 2015. In an exclusive with BBQ, Yende shares some of her personal journey and aspirations with our readers and tells us who the dynamic lady behind the corporate face really is. Born and raised in Soweto, Yende is the youngest of her four siblings and while attending high school at Immaculata High School in Diepkloof, Soweto, she reminisces about school holidays spent in Pietermaritzburg and her early days at university. Yende holds a BA Honours degree in Social Work, a diploma in Integrated Marketing Communications from AAA School of Advertising, and a Masters degree in Public and Development Management. To Yende, family remains central and she labels her own as a close-knit, loving unit founded in Christian values, who keeps a circle of trusted friends. A self-proclaimed perfectionist, both at work and at home, she describes herself as high-performing in everything that she does, accompanied with a keen interest in making a difference in the lives of others. Yende was announced winner of Africa’s Most Influential Women in Business & Government 2015 by CEO Global in July last year, and in August she was awarded the Youth Employment Award SA 2015 by the South African Council for Graduates Co-operative. Looking at her road travelled with FP&M SETA, she says back in 2011, when Government decided to cluster sectors in order to strengthen value chain linkages between related industries, it was somehow frowned upon and some stakeholders were quite nervous about the decision taken by the Minister of Higher Education and Training, Dr Blade Nzimande, to amalgamate the various SETA’s. Today Yende sums up the amalgamated FP&M SETA in three words: “exciting, successful, and futuristic”. She says although amalgamating the three SETAs was no easy job, she is very comfortable with the progress that has been made and with the state of FP&M SETA today. 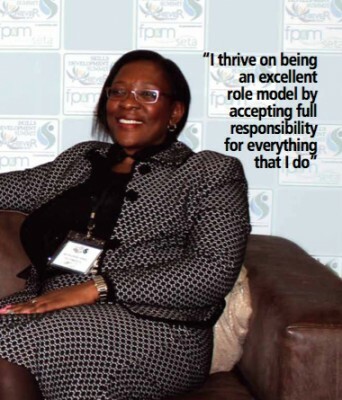 Her move to FP&M SETA was a strategic one, aimed at ensuring a smooth transition after the amalgamation of three SETAs, and to steer the organisation in a new leadership direction. With a strong socio-economic transformation background, being the driving force behind transformative change and drafting policies and modules for implementation in various multitudes---and contributing meaningfully to the improvement of her former employers’ transformation imperatives---her appointment as CEO of the SETA was spot on. The core business mandate of the FP&M SETA is to provide skills development services to 13 industrial sectors, which includes some of the most challenging sub-sectors from an economic growth and sustainability perspective. The FP&M SETA today provides skills development services to the clothing, footwear, textiles, leather, forestry, furniture, general goods, print media, printing, packaging, publishing, pulp & paper & wood products sub-sector. When asked about her leadership style, Yende describes it as transformational with elements of transactional leadership; visionary; empowering; strategic and decisive; and fair and bottom-line focused for value add and sustainability. “I thrive on being an excellent role model by accepting full responsibility in everything that I do. I build strong high performing teams that would take organisations to new heights,” she says. Having been actively involved in transformation at various companies including BHP Billiton and PwC, she holds fast that transforming lives and the careers of people has become a keen passion. In the same breath she however admits that she would be in denial if she does not concede that much more needs to be done to transform the country. Looking at the successes the SETA has achieved, she says there is almost too much to mention. Yende says to fully understand the growth and successes of the SETA, one needs to go back and track significant events over the last four years, post amalgamation. “The introduction of a highly strategic business model developed by myself paved the way for a complete turnaround and the streamlining of the SETA’s operations and processes. This has resulted in the establishment of a best practice organisation that has met and exceeded organisational objectives and performance standards. I am pleased to inform all of our stakeholders that strategically we are fully aligned to support Government in addressing the MTEF priorities, more especially unemployment and poverty alleviation. “In order to promote labour absorption within our sub-sectors we have encouraged our industry partners to develop sector strategies aligned to skills development action plans that would promote economic growth and sustainability of our industries. Our research partnership with WITS University has yielded excellent results---everything we do at the SETA is informed and underpinned by research. Key to the success of this intervention has been the ability to accurately identify the critical research activities undertaken in collaboration with our research partners to identify the occupations in demand within our sector,” she says. Yende also points out that they have received huge support from the private sector and that she is very compassionate toward their mandate. She says she is astounded by the resilience and capacity within the private sector for skills development and that it is creates just as many new, quality jobs as government. “It is an honour to partner with the many credible private sector organisations that collaborate with the SETA to advance the skills development mandate,” she says. Having recently won Africa’s Most Influential Women in Business Award, Yende says the experience has been humbling since moving from corporate to government has its own cons, but when people recognise your input, it is “amazingly rewarding”. Having won the Public Sector Visionary Award at last year’s BBQ Awards, Yende says that when it comes to what being public visionary is about it entails an attitude of zero tolerance toward corruption, a focus on compliance, excellent service, and professional business conduct. Transcending normal operations to allow strategic conversation in order to deliver on strategic projects are critical components to visionary leadership according to her. A question that could be posed, is if whether vision can be nurtured or whether it something that one is born with? According to Yende, it comes down to nature versus nurture. “All of us have the capacity to develop and become better at what we do. We are born with the capacity to develop, but not with specific attributes. This is not the reserve of a few gifted people. Everyone one of us have the potential to become great visionary leaders. Leadership skills is something that we nurture. We just need to ensure that people are given opportunities,” she says. In terms of nurturing vision, Yende makes reference to one of Nelson Mandela’s famous quotes: “Education is the most powerful weapon which you can use to change the world.” She says embedding coaching and mentoring in our youth development is one way of establishing results-sustainable training for small businesses. An environment that is conducive to nurturing vision is according to her one that denotes team-work and that is enabling at the same. Here, the harnessing of evidence-based research principles and trying out new ideas is of utmost importance. When asked about the topic of leadership, Yende highlights respect, responsibility, integrity, honesty and most importantly, as she puts it, accountability. “A good leader will always delegate responsibility but not overall accountability. An effective leader will build capable and strong leaders that will ensure succession planning without fear. This is the type of leadership I personally strive for,” she says. Yende says some leaders that she personally looks up to is Brian Molefe (Eskom CEO), who she says has delivered with humility, as well a number of women leaders, including Nkosazana Dlamini-Zuma and Winnie Mandela. While challenges remain a normal part of implementing a vision, Yende says when overcoming them it boils down to strategic thinking and putting a plan in place. “All challenges can be overcome. It does not have to become overwhelming if you are well organised and think about the steps you want to take. There is no harm in consulting with superiors and even sub-ordinates. Lead by example,” she says. My motto in life is… to never stop learning and strive to do the best in everything irrespective of the circumstances. Stay focused! I would like to be remembered for… making a difference in someone’s life, however big or small. My ultimate job would be… to lead a big corporate. The most important item in my handbag is… my lipstick. If I could do one thing in my life over… it would be continuing to be the best person I am destined to be---me.